Welcome to week three of my Fitbit Ionic challenge. I'm Becca Caddy, and I'm on a mission to get fitter using heart rate – with the help of the Fitbit Ionic. In week one I went running using my bpm as a goal for my session, while in week two I hit a yoga class, and took a look at stress via breathing exercises and the effect on my bpm. So what's up next? 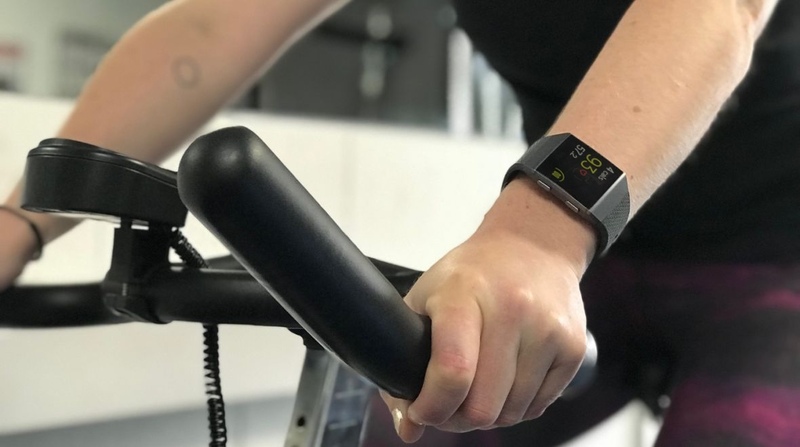 Well, given that Fitbit ambassador (and my guiding light for this project) Greg Whyte recommends using the Ionic to add more workouts and fitness challenges to your routine – I was keen to try something completely new. He suggested that after trying yoga I pick a high energy activity, which will ensure I spend time working out in Fitbit's Cardio zone and might push me to my Peak too. I chose spinning. "In terms of getting the most out of your fitness training, picture it as a jigsaw," said Greg, with a goal to hit those all-important heart rate zones. "Most people won't know what their heart rate zones are. You can pay money - sometimes a lot - to have a specialist help you identify zones," said Greg. "But we can do a good job of discovering them fir ourselves. "That's what I think Fitbit is really good at; it gives you data about your heart rate zones and each zone will deliver something slightly different. What you're trying to do is include activity in each of the zones, something in Fat Burn, something in Cardio and even something in your Peak zone," Greg continued. But that's not all. Sure it's important I hit the different zones and have a plan before I workout, but Greg explained there are other benefits to mixing up your routine. "By adding variety, it means it's a lot more enjoyable as well. Variety is really important for that reason too," said Greg. For those not already smitten with Psycle or bonkers about Boomcycle, spinning bikes look similar to regular exercise bikes but the key difference is the weighted flywheel, which picks up speed as you pedal. The seats and handlebars are also adjustable, as is the resistance. So in other words, it feels much more like you're riding a real bike, but you're in a gym. Spinning has really taken off in recent years. Part of its appeal is the absence of moves or routines and the ability to work within a range of heart rate zones. The low impact nature of spinning also makes it ideal for anyone with an injury - which makes it perfect for me and my dodgy knee. Sessions are structured to get you working in a range of zones, with high intensity sprints merged into hill climbs, so there's no escape for your body. And while the sessions are instructed, effort levels and resistance are down to you – so the key is working as hard as you can. And that's where tracking your session with the Fitbit Ionic comes in. Heart rate is a global measure of your effort level, regardless of individual fitness, so you can keep yourself honest by ensuring you're hitting those zones, straight from the wrist. It's a great exercise, but it can be intense. So you need to ease into it to give your muscles time to adapt. When I arrived for my first spin class, there were about 12 people in the class and we started off slow and then worked up to a high-energy mixture of sprints, hill climbs, intervals and circuits by changing the resistance of the bikes and changing our positions on them throughout. Most classes are usually 40 - 50 minutes, but I took a 30 minute beginners class and was advised to take it easy and see how I got on. Like with yoga, I had to change the Fitbit Ionic's default exercises and select 'Spinning'. Seated on the bike it's easy to look at your wrist, so I customised the screen and added time, heart rate and calories burned (just for some added incentive). I also adjusted the settings to keep the screen on, so I wouldn't even have to press the button to see how I was doing. As you can see, the session really got my heart rate soaring. I was in the Cardio zone for most of the session, with some spikes into the Peak zone when I was pedalling fast and had dropped down the resistance of the bike. It was an enjoyable experience and I was definitely motivated to push faster and harder because I was surrounded by enthusiastic people who are all really, really into it. "Working too hard in multiple sessions, or back-to-back sessions, is what leads to fatigue and that's when the potential for injury rises." With the Fitbit Ionic I was able to keep tabs on how hard I was working and slow down if I felt my heart rate was soaring and my legs were aching a little too much. But it's what I can learn for next time that's really interesting. I'll aim to get my heart into the peak zone for longer, and try and end the session with a higher average heart rate – I can set a goal for my next spin session from the heart rate data from my Ionic, and it suddenly becomes clear how I can start using data properly. After the spinning class I felt tired, but my heart rate was still high and it continued to be a little higher than usual all evening – which I quickly detected via the Ionic screen. I've got a good handle on my resting heart rate (RHR) after my chat with Greg in Week 1. Mine tends to be around 56bpm and after spinning it was much higher at around 76bpm. No doubt this wasn't helped by racing around after a class, way too much caffeine (hey, I love a flat white) and by bed time I was feeling frazzled. I've experienced this feeling after a really intense workout before, so I asked Greg to talk to me a little bit about sleep, what it means and how it's connected to heart rate. "One of the greatest things about Fitbit is its ability to monitor sleep - it's the one thing you can't do yourself. You need tech to do that for you," said Greg. "It's a great global measure of lifestyle, fitness and stress, definitely keep an eye on it and develop strategies to improve." Here is my sleep data the night after spinning. As you can see, the Fitbit Ionic is a brilliant sleep measurement tool. Each night our bodies cycle through different sleep stages, which you can see above. There's Awake to REM to Light to Deep. A lot of other activity and sleep trackers keep an eye on these stages based on how much you're moving around. But Fitbit uses its heart rate sensor to measure your time spent in each stage more accurately. This makes it much easier to understand your personal sleep quality and learn whether you spent enough time in each sleep stage too. At first so much data can seem a little overwhelming, but it's actually really fascinating to be able to delve into your sleep stages like this in so much detail and keep track of why your sleep might be changing day on day. My sleep quality tends to be quite good as a general rule, but there were a few periods when I was wide awake and just couldn't settle - as you can see from the screenshot above. Greg explained that although it looks like I had periods of being awake, that's actually really normal. Phew! Greg and I discussed ways to help me sleep better, from getting a variety of exercise (not just the high energy stuff) through to improving my stress levels, using the Fitbit Ionic's breathing tool and taking important steps before bed, like not looking at screens. One thing he suggested was paying close attention to Fitbit's Sleep Schedules feature. This is a smart way of giving you a nudge into a better night-time routine by recommending a personalised sleep schedule based on how you've slept recently, what your goals are and when you want to wake up. Research shows that sticking to a consistent bedtime and wake-up time is important to getting a better night's sleep. So, I set up the Sleep Schedule reminders on my phone, that way the Ionic can remind me when I should really be switching off and heading to bed. Sure, I'm not going to turn off an episode of Stranger Things 2 mid-episode, but it helped me not to binge-watch three more episodes afterwards. There's also Fitbit's Sleep Insights feature, which takes all of that interesting sleep data and does something meaningful with it. The app serves up handy suggestions about sleep that have been shown to help people of the same age and gender, but what I find most interesting is the facts about sleeping that pop up under your sleep graphs. I've found that the better educated I am about sleep, the better I feel about nodding off each night. I'll be keeping an eye on how my sleep is affected throughout the challenge, and hopefully use yoga and the Fitbit Ionic's breathing tool to get me into a better state before I head to bed over the next few weeks - especially after I learned last week that yoga can really reduce my stress levels. That way I'll hit bedtime feeling tired - not wired!